Citation: Rev. MeO. 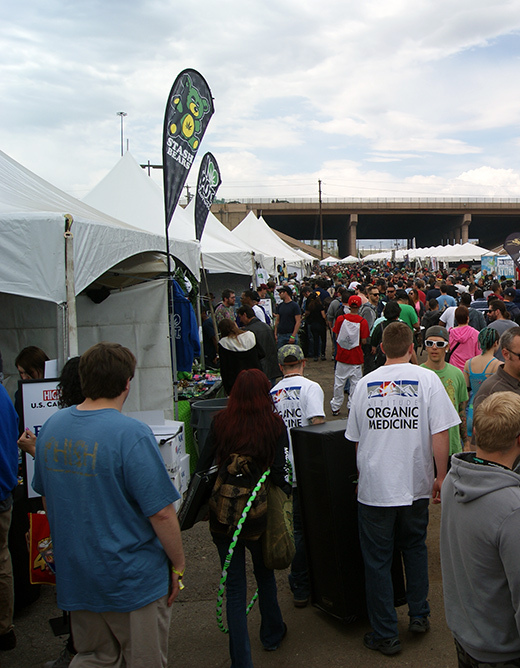 "A Legal Green Giant: Roadtripping to Colorado's Post-Pot-Prohibition Cannabis Cup." Erowid Extracts. Jul 2014;26:2-6. Tasked with exploring the United States' first legal recreational marijuana scene in nearly 100 years, what I encountered was a mix of red tape and jubilant celebration. Despite traveling to Colorado from the Deep South--a deeply conservative region still resistant to medical marijuana--the reality of purchasing the newly over-the-counter psychoactive substance with the express intent of using it to get stoned wasn't nearly as surreal as anticipated. It's generally understood that you don't buy fireworks from the first fireworks stand across the state line. Although the quality might be as good as those sold 10 miles farther down the road, selection is often limited and prices high. The same seems to apply for recreational cannabis in Colorado. Upon exiting the freeway at the first cannabis shop most out-of-state visitors encounter, I am thrilled but also quickly turned off. The establishment is a worn, whitewashed house with a dinosaur on the roof and a greenhouse out back. It's located in a setting where one might expect to find a body in a burned-out car, not jars of legal recreational marijuana. A light rain begins to fall as I stand in line outside for 20 minutes before entering. Once inside, a security guard takes my ID and quickly hands it back. Now I can sit inside in the waiting room, behind perhaps five other customers. The person who came in with me shows the guard her ID, which he demands must be scanned through a machine to tell if it's authentic. "It's the law", he says. Upon exiting the freeway at the first cannabis shop most out-of-state visitors encounter, I am thrilled but also quickly turned off. "Calm down, we don't give your info to the FBI or nuthin'. It doesn't leave this building." She had seen that my ID wasn't scanned and asks the others in the waiting room about their experience. No one else had had their ID scanned. "The machine was down when they came in, but it's back online now so I have to scan your ID." That certainly suggests the scanner is connected to other systems, yet the muscle is claiming that customer data doesn't go anywhere. Good luck with that. "Well then don't you have to scan their IDs?" she persists, pointing at the drug tourists that fill the waiting room. "I already looked at their IDs," he says. "Now, let me scan your ID or you'll have to leave." She leaves. The one local in the room proudly exclaims that his ID has been scanned numerous times before and he didn't care who got his information. The out-of-staters, including a schoolteacher from Louisiana, don't seem to have the same casual mindset about connecting their names with the purchase of a substance that is illegal federally and in their home states. There are surveillance cameras everywhere--on the front porch, in the waiting room, and in the salesroom. These data-collection actions are an affront to privacy and freedom, but many people argue that they are growing pains that will work themselves out over time. Indeed, Amendment 64, which permits the recreational use and regulation of marijuana in Colorado, does contain text regarding customer privacy--but it leaves the option of data collection up to individual businesses. IN ORDER TO ENSURE THAT INDIVIDUAL PRIVACY IS PROTECTED, [... 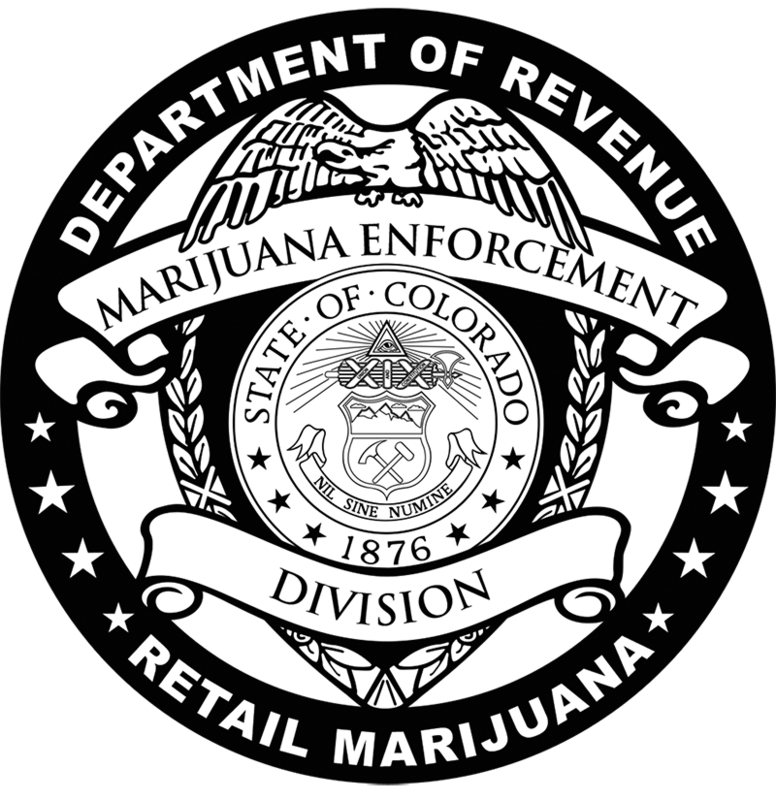 THE DEPARTMENT SHALL NOT REQUIRE A CONSUMER TO PROVIDE A RETAIL MARIJUANA STORE WITH PERSONAL INFORMATION OTHER THAN GOVERNMENT-ISSUED IDENTIFICATION TO DETERMINE THE CONSUMER'S AGE, AND A RETAIL MARIJUANA STORE SHALL NOT BE REQUIRED TO ACQUIRE AND RECORD PERSONAL INFORMATION ABOUT CONSUMERS OTHER THAN INFORMATION TYPICALLY ACQUIRED IN A FINANCIAL TRANSACTION CONDUCTED AT A RETAIL LIQUOR STORE. The amendment makes a liquor store analogy, but I've never encountered a liquor store that requires customer data be recorded (including two visited in Colorado during this trip). Despite my concerns about the data collection, I'm dying of curiosity about the shop and the whole scene, and after a 30-minute wait it's my turn to enter the single-customer salesroom (yes, even three months after sales to recreational users became legal). "It's usually not this busy," the local shares, "Sometimes I walk right in." It's been an exceptionally busy mid-week day, according to the security guard. "It's usually only like this on the weekends when the tourists come in. I dunno, maybe this is because of 420 or something." Yes, 4/20 (April 20) is just a few days away and I'll be spending it at the Cannabis Cup in Denver--the first time the event has ever been held in a location where marijuana is specifically legal for recreational use. Entering the salesroom, my awe-struck eyes widen at the profound novelty--I'm looking at legal recreational marijuana that I can buy and smoke! (Legal to smoke in a few places, anyhow.) Despite that novelty, I feel a bit ripped off after waiting so long, to be given a choice between only three strains. Plus, the only indica-dominant option is almost sold out, and that's the variety I wanted for that evening. So there's one choice, no edibles, and plenty of uninspired glass pipes. I jealously look at the unstaffed "medical" counter, with its eight full jars, each a different strain. The budtender explains that they have to maintain a reserve of cannabis for medical customers--even though there didn't seem to be any. He glances at my ID, weighs out the amount selected and prints a label, which he affixes to a solid-black plastic bottle. I purchased four different strains from three shops to experience a variety of what the legal, recreational cannabis scene in Colorado has to offer. All around, the quality was leagues beyond that typically found in black market marijuana in the Deep South. The next day, in Denver, I visit a shop that I was assured would blow the first one away. It was a moderate improvement. While it doesn't look like much from the outside (which is normal for cannabis shops), it has lower prices as well as a greater variety, including edibles and concentrates. The legal recreational prices in Colorado, mind you, are on par with black market marijuana prices in many other states. But the peace of mind...ah. Easily worth the tax I'm paying to the state. This shop in Denver also enters customer information into a computer. I ask why. "It's our policy", I'm told. They specify that it is meant to catch fraudulent IDs. I keep my critique to myself, but really? They need to type my info into a computer to determine that the plastic ID in their hands is authentic? Though not required by Colorado law, some have suggested that county or city jurisdictions have tried to enforce specific data-collection rules. This would be a non-issue if the shops simply examined each person's ID, but they seem to be logging individualized information tied to each purchase. This shop, like the first, claims customer information doesn't leave the building. "If you don't comply with our process, there are other shops you can visit", the hostess says bluntly behind bulletproof glass. 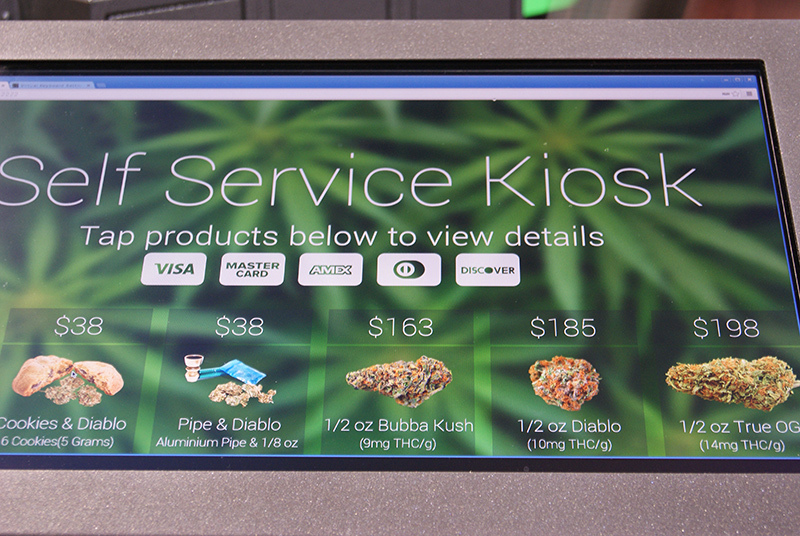 Despite disliking the ID scanning policy and the "take it or leave it" attitude, I'm on a mission to explore a variety of these shops, and again the budtenders in the salesroom are helpful. This shop has a larger salesroom with salespeople working with multiple customers. 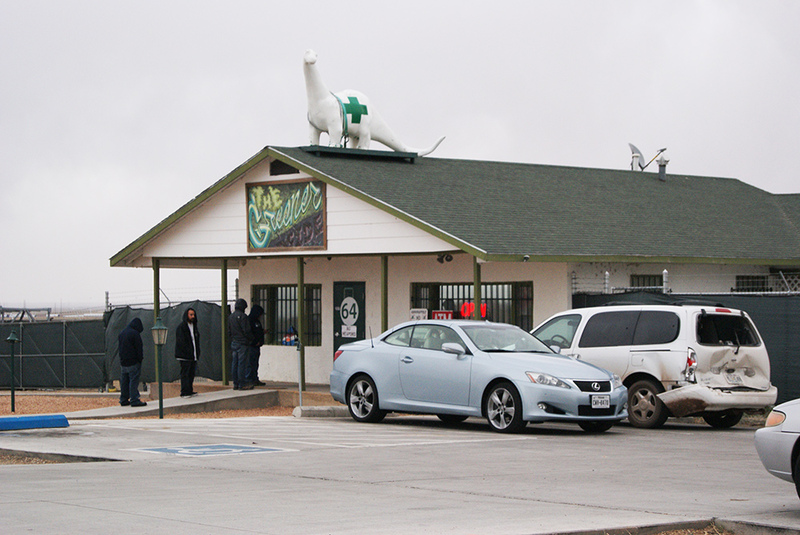 The shop's medical customers use a separate counter that has more strains and more quantity than the recreational side even though recreational is where the business is right now. I jealously look at the "medical" counter, with its eight full jars, each a different strain. Take three. I arrive at a shop in Boulder, about 15 miles outside of Denver. Based on appearance alone, one might expect this to be a handcrafted soap store, or some other small, independent business. Even with a large, boisterous crowd (like at a coffee shop), I'm quickly escorted into the salesroom, after my ID is ever-so-briefly glanced at while remaining in my own hand. There are approximately ten different strains from which to choose. The entire staff is pleasant. They have edibles. They have fair prices. I'll gladly spend money here. Paradoxically, I also see a young couple handcuffed and being patted down by a police officer in a small park. If I were profiling them, I'd suspect they were busted for smoking marijuana--a no-no on public lands. I was attracted to Colorado at this specific time by the historic marijuana-industry events in Denver. For the first time, High Times' Cannabis Cup partnered with the BIG Industry Show to create a five-day, multi-event marijuana celebration. This maneuver ensured greater attendance for each of the individual events. In early February, event organizers announced they were anticipating 15,000 attendees. Less than a month later, in what felt like marketing spin, their estimate had doubled--"Sure you're going to draw 30,000 people. Keep on dreaming, stoner." Yet, on April 15, four days before the event began, tickets were sold out and the estimated number of visitors had grown to 37,000, almost four times that of the 2013 Cannabis Cup in Denver (and even that year was record-breaking, at an estimated 10,000 attendees). This was to be the largest Cannabis Cup in history, including all of those held annually in Amsterdam since 1987. The buffer day between the B2B trade show and the Cannabis Cup featured "the Galleria". It showcased the art of glass, with live glass-blowing sessions and displays of pipes so stunning one wouldn't dare blemish them with resin. The BIG Industry Show kicks off the epic pot weekend on April 16. This closed-to-the-public event is organized by the Buyers Industry Guide, "the most complete listing of manufacturers and wholesalers in your industry"--a catalog that goes out to more than 5,000 head shops and related businesses nationwide. The event itself is much like any traditional business-to-business trade show, with rows of vendors in booth spaces trying to get the attention of passing "buyers". The difference: Every exhibitor here represents a piece of the medical, recreational, or "grey" (think head shops) marijuana industry. Some less cannabis-related businesses are represented but in the minority; the most prevalent are booths promoting e-cigarettes, "e-juice" and nicotine vaporizers. Along with other legal-across-most-of-the-US products (psychedelic posters, kratom, etc.) they have just enough of a presence to stand out as foreign. That adds to the surreal nature. For once marijuana isn't the outsider, it's the loud and proud star, as attendees (predominantly male) conduct business while consuming a drug that hasn't been legal for recreational use in the US since the 1920s. I had a good idea as to what I was getting into, so my raised-in-the-Bible-Belt sensibilities don't suffer a major shock. But entering the building is like walking into another dimension. Imagine an early 19th-century carny hawking: "Reefer for sale! Come get your reefer! I guarantee we've got the finest intoxicating smoke this side of the Mississippi River!" Exhibitors also buck trends by including scantily clad "booth babes", a practice that is almost nonexistent at mainstream trade shows in recent years. Going into the show, I'd heard warnings from the mainstream media about the possible dangers of smoking or vaporizing super-potent cannabis concentrates, alternately called "dab", "wax", or "shatter". The concern was that people could pass out if they consumed too much, and yadda, yadda, may hit their head upon falling and then die. Yet it seems everyone in attendance takes at least one toke of the gorgeous sticky extract; samples are generally available for free. This includes thousands of people who had likely never heard of "dabs" before. Pleasantly, people tolerate the concentrated materials well and I learn of no injuries attributed to them. It seems everyone in attendance takes at least one toke of the gorgeous sticky extract; samples are generally available for free. 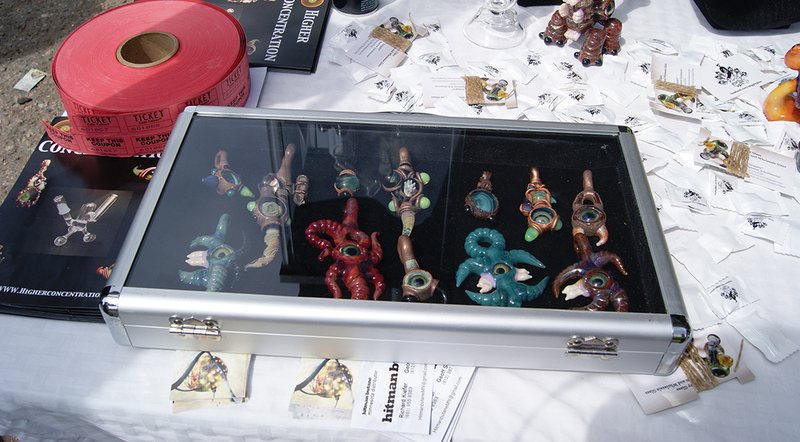 Not only are dabs readily available, so are countless accessories: non-stick mats, containers, metal tools usually seen in a dentist's office, dab vaporizers ranging from discreet portable e-cigs to gaudy plug-in contraptions, butane, and devices across the spectrum used to manufacture the concentrated end product. "It only takes 15 minutes to make!" says one salesperson peddling a simple plastic butane-based dab-maker that reminds me of a caulking gun. Still stoned from a half a joint in the morning, I'm curious and enthusiastic about dabs. I inhale three within an hour or so, on offer from two booths. For several hours I walk around the show floor, interacting with people while incredibly high, but details of the remainder of the day exist only in notes and photographs. Memory of those hours is lost to wisps of an outstanding legal medicine, consumed recreationally. I do remember a nice touch at the onsite ATM: the surcharge fee was $4.20. April 19. Tremendously long lines of humans wind around several buildings at the Denver Mart (including a local sheriff's substation), along the edges of the filled-to-capacity parking lot, beyond the fenced entrance, and down nearby sidewalks. Pleasant, but not entirely helpful, security personnel occasionally walk along the lines to holler, "You cannot bring more than one ounce of marijuana into the building! ", like bouncers telling the assembled queue at a concert that recording devices are not permitted. The difference between the BIG Industry Show and the Cannabis Cup is immediately apparent. Since the Cup is open to the public, the event quickly transforms into a sea of stoned humanity. Multiple indoor exhibit spaces and a parking lot with long rows of booths are packed with people, including a larger percentage of female attendees and more "booth babes". It's not mosh-pit crowded (I could see the ground), but I have to maneuver through streams of people. When an area is especially crowded, it's inevitably because a nearby booth is doling out dabs. "Spin the wheel, win a dab" is a new take on an old trade show game. At one booth promoting high-quality concentrates, the salesman explains that their butane-based extraction is 83% THC, the solvent-free version is 80%. "Which one would you like to try?" That's what these magical days surrounded by tens of thousands of cannabis fans are like. If you attend any part of the festivities and aren't offered free dabs, then the universe is against you. The exhibitions are much more cannabis-focused than at the BIG Industry Show. Rather than all-things-head-shop, this is all-things-weed. The nicotine e-cigs are gone, as is the kratom, replaced with, among others, a company promoting 10-pack tins of filtered cannabis cigarettes. These stoke a special interest for me because of a story a family member once told me: He claimed that during the Vietnam War, he saw fields of cannabis being grown by US tobacco companies, as well as their four-joint packaging. "They were ready to pounce on the market once marijuana was legalized, which they felt was imminent." This filtered cannabis cigarette business is now realized, and takes itself seriously: Each cannabis cigarette is standardized to contain 100 mg of THC (roughly the equivalent of a gram of good bud) in a blend of strains: Ghost Train Haze, Scott's OG, and Larry OG. Sadly, smoking these machine-rolled joints isn't as satisfying as expected. The filter prevents getting a nice draw, resulting in more time that the product just burns. All that goodness going up in un-inhaled smoke. I love the idea, but they need work. I do see paramedics carrying one person on a stretcher, clearly awake, talking on his mobile phone before entering the ambulance. The reason for that emergency is unknown. Keep in mind, there's a very real medical-use contingent at the show, so ill people are in attendance. I'd be surprised if the person I saw on the stretcher was the only one requiring medical attention at a show of this size--health emergencies happen at large conventions and trade shows all the time. On the final day of festivities (April 20), I encounter two black-market marijuana dealers. Both claim to have bought too much while in the state and need to unload it before going home. The first interaction takes place outside of the venue, unbelievably right in front of the sheriff's substation. The second occurs inside the Denver Mart. I don't ask about prices or strains because they make me a little paranoid, so I move along quickly. The stuff is legal to be bought and sold at regulated shops. I'm not going to be greedy and get arrested for buying illegal marijuana (which everyone claims is cheaper) while in Colorado. The entire experience was educational and pretty damn fun. I enjoyed the change of scenery, the novelty, and the cannabis. Beyond the questionable practice of logging customer information, one other sticky wicket got my attention: marijuana-related driving-under-the-influence (DUI) arrests. In Colorado it takes only five nanograms of THC per milliliter of blood to be over the legal driving limit. And you cannot refuse a blood draw without consequence. How high do you have to be to exceed that limit? In March, a Colorado Department of Transportation spokesperson told USA Today, "One hit could put someone over the limit." One toke over the line, indeed. Regular marijuana smokers are likely "too high to drive" all the time, even when not inebriated. I love many aspects of the "Colorado Experiment", but regulations persecuting cannabis consumers in ways known (bogus DUIs) and not yet known (consequences of documenting federally illegal activity) need to be eliminated. I look forward to the day when cannabis users have no reason to be paranoid, other than from the direct effects of the weed they're smoking. 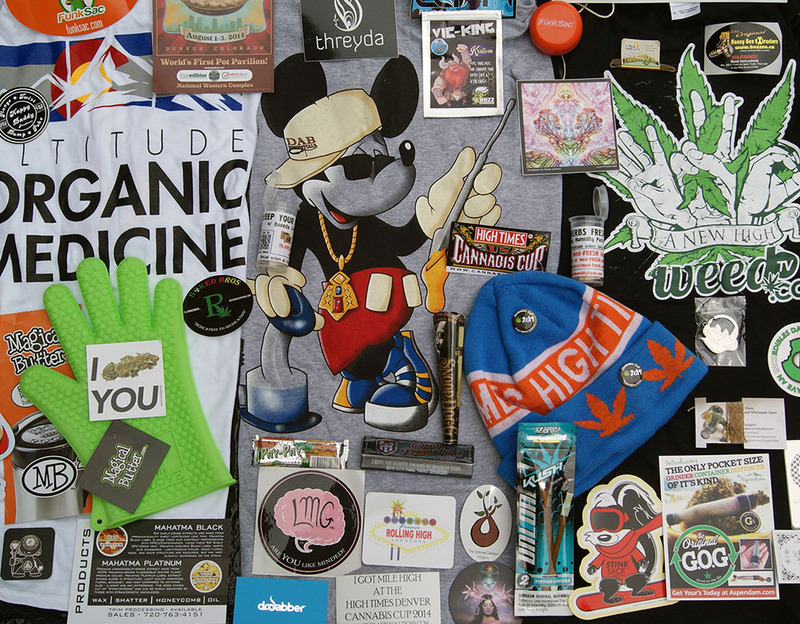 A collection of cannabis-related schwag. v1.01 - Oct 2015 - Erowid - Published on Erowid.org.